Levira: new OB-SNG uplink unit for HD production. 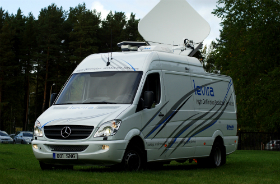 Levira’s TV production team has renewed its SNG vehicle into a combined uplink and production unit that is unique in the Baltic countries. “As a rule, it takes two different vehicles - one for production and another one for live transmission. We have developed a much more convenient and cost efficient solution for our clients – Levira’s new OB-SNG unit fulfils both of these functions,” says Kulno Kägu, Head of TV Production at Levira. 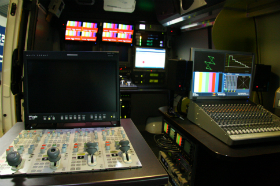 Levira’s renewed production truck supports both SD and HD formats, and it can work with up to six HDTV cameras. The station is equipped with graphics and slow-motion equipment and its SNG uplink fully complies with all EBU requirements. This ensures excellent technical conditions for recording of sports events, but also various concerts, festivals, conferences or any other events. The new unit was first used for live production of the Estonian Football League’s season opening match in March. Levira has a highly-experienced TV production team, who has produced many small and large-scale events including EuroBasket 2011 final tournament in six cities in Lithuania (2011); FIFA World and European Championship qualification games in Estonia and Latvia; World Cup Speedway races in Sweden (2011-2012); Luge World Championship races in Sigulda and Paramonovo (2010–2012); Skiing World Championship races in Estonia, Scandinavia and Central Europe (2008–2013); Figureskating European Championship in Tallinn (2011); Estonian “Dancing with the Stars” (2010-2011) and “Superstar” TV shows (2009–2011), to name a few.